Some useful tips for Dog Owners! Your dog will be very excited upon arriving home. Excitement leads to thirst. Give your dog only a small amount of water or ice cubes in the first half hour. 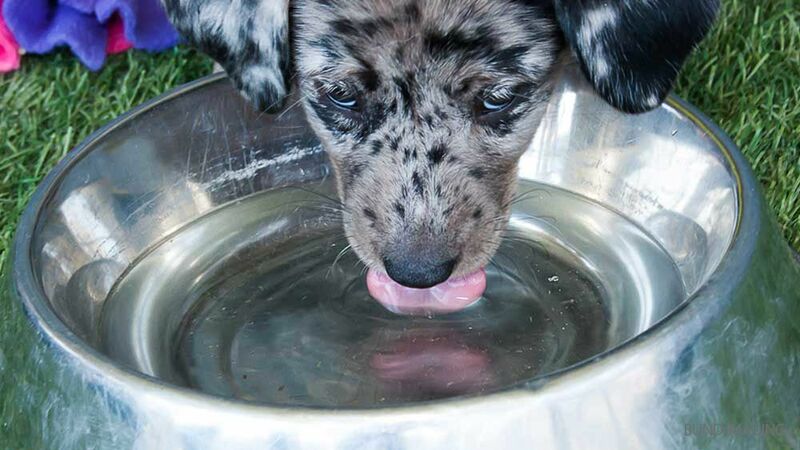 Do not allow your dog to drink a large amount of water as this may lead to stomach upset. Please ensure your dog has a cool, quiet place to rest before being fed or engaging in any strenuous activity. We do not recommend feeding your dog for at least one hour after returning home. Your dog may be too tired to play with you when he or she arrives home. Often dogs seem lethargic or “stiff” and generally this is normal. They have played with their friends all day, everyday. No worries. Your best friend will be back to being your energetic buddy in a day or two. It’s common that dogs will lick their paws after a visit with us. The licking of the paws is usually associated with the pads being sore from running around all day. The pads can sometimes develop blisters (generally uncommon) but this usually goes away in a day or so. Playing, chasing balls and each other, jumping in and out of the pool, and having general doggie fun, what can we say, your dog may get dirty! Before your super dog goes home, we do try to towel them off and give them a quick brush. Yet even with this once-over, inevitably they will not be as clean as they were on their arrival. We suggest booking a bath or grooming appointment for your best friend’s departure day. Our dog grooming packages guarantee keeping your ultimate K9 feeling and looking great.